Over the past few weeks I have been called naive, stupid, brave, predictable, slow, cumbersome and astonishingly, cute. All this, because I was making a television programme. Mind you, all that was nothing compared to some of the name-calling suffered by the people I have been interviewing. Former Wales rugby union international and now rugby league player Gareth Thomas, former British basketball star John Amaechi, tennis legend Martina Navratilova and All-Ireland hurler Donal Og Cusack have all tried to help me understand why in 2010, 10 years into the 21st century, we have only ever had one openly gay footballer in this country. It was 1990 when Justin Fashanu announced his sexuality to the world via the front page of the Sun. It was 1998 when his body was found in an east London lock-up. He had taken his own life. His story, his experiences and more than anything else, his death still dominate the subject. 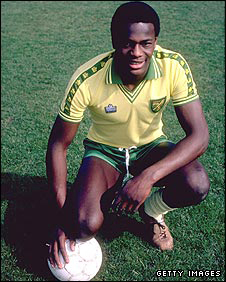 'No player will come out because look what happened to Justin Fashanu' is a common argument. When I mentioned on Twitter I was writing this documentary, Fashanu was mentioned in one of the first tweets I got back. But as much as we cannot ignore Fashanu, what part do the media play, the fans, the companies who plough billions into the sport and the players themselves? Is any one of them more responsible than the rest for the fact that other sports can deal with openly gay players and football seemingly cannot? The answers came from the sporting legends I named at the start. They also came from the managing director of Hill and Knowlton, a big sporting marketing and public relations agency, the head of Let's Kick Racism Out of Football campaign Piara Powar and Brian Noble, who is the coach of Crusaders, where Thomas plays his rugby league. I also pulled on my boots to join the London Titans football team in a gay friendly league, hence the slow and cumbersome comments. But have you spotted anything missing in my list - a footballer maybe? Just one player stuck his head over the parapet. Numerous calls, texts and e-mails were made or sent. Most were ignored, some were politely responded to but only one was accepted. I thank Clarke Carlisle for answering his phone to me and then speaking to me on camera eloquently, intelligently and with honesty on the subject. I asked the Burnley centre-half if, as a straight man talking about this, he would get stick from the footballing community for speaking out. "Without any doubt," was his reply. There have already been accusations that a programme like this will make more of an issue out of the subject. I don't have a burning desire for a player to be openly out, there is no need for a player to be openly out but there is a need for the national game to be in a position to make it possible for a footballer to come out if they so wish. To allow them to be who they are without a fear of losing a boot deal, of being ostracised by team-mates, of being spat on or being abused by fans. It took one of my best mates, who I always went to football with, until his late 20s to come out to me. If there had been an openly gay footballer, would my friend have come out earlier and saved himself years of turmoil? Amaechi told me it would have made no difference and that I was just "cute and naive" for even suggesting it. I disagree - and more importantly my friend thinks it would have helped him. There is no salacious gossip in this documentary. I do not out a footballer which is what some people might be expecting, and which a couple of other television companies wanted me to do when I mentioned this subject to them in previous years. It simply asks whether sport's last taboo will be broken? It is down to all of us connected to the game to help with the answer.